Cube 2 courgettes and slice 2 leeks, then cook in a large pan over a medium heat with 1 tbsp essential Waitrose olive oil for 5–6 minutes, until slightly softened. 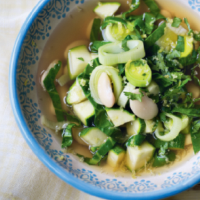 Add 1 litre vegetable stock with 100g spring greens, shredded, and a 400g can essential Waitrose butter beans that have been drained and rinsed. Simmer for 15 minutes. Grate in the zest of ½ lemon and scatter with 1 tbsp chopped flat-leaf parsley. Serve with crusty bread.